I have spoken before about my love of not only foil cards, but foreign language foils. You may not agree with me, but I am really in touch with the collector nature of my soul. 1) Browse eBay continuously. I admit, I have a number of weird alerts set for eBay. There are probably not five other people on this earth who have a alarm set for when a French foil Vindicate shows up on eBay. I have been known to lose a lot of time in the evening just clicking through the many pages of four and offerings on eBay, with some bids and purchases making Commander decks a little more exotic. 2) Magiccardmarket.eu and its sellers. For quite some time, this was the only organized way to look for non-English cards. Star City would list when they had such versions of a card, but it was very hit-or-miss. MCM runs much like a TCGPlayer for Europe, allowing players to sell cards at a price of their choosing, and taking a cut of sales. There was a big problem, though. Shipping was pricey, yes, but international shipping will never be easy. MCM did not allow for American residents to join as buyers or sellers. Instead, you had to sign up with the admins and basically pay shipping twice. Once for the seller to ship to the admins, and then they would send to you, for an additional percentage. I went through this process once, and while I got the cards I wanted, I paid a significant markup that left me unwilling to do it twice. I argued, unsuccessfully, that they were losing out big time, but they wanted to remain Euro-centric. TCGPlayer now allows sellers to list foreign-language cards, and this is amazing for those of us with a magpie’s eye. It also offers a unique opportunity to test the presumptive value of the individual languages. It’s been said by myself and others that Korean, Russian, and Japanese are the more expensive languages, with Italian, French, Spanish, and other Continental languages often going for less than English. Many sites don’t bother with foreign cards, but with many individuals able to list their singles, TCG offers a marketplace more defined by what people will pay, as opposed to what some think a card ‘should’ be worth. I’d like it best if TCG offered a version of eBay’s ‘completed sales’ but that’s me being greedy. Let’s get to an example. 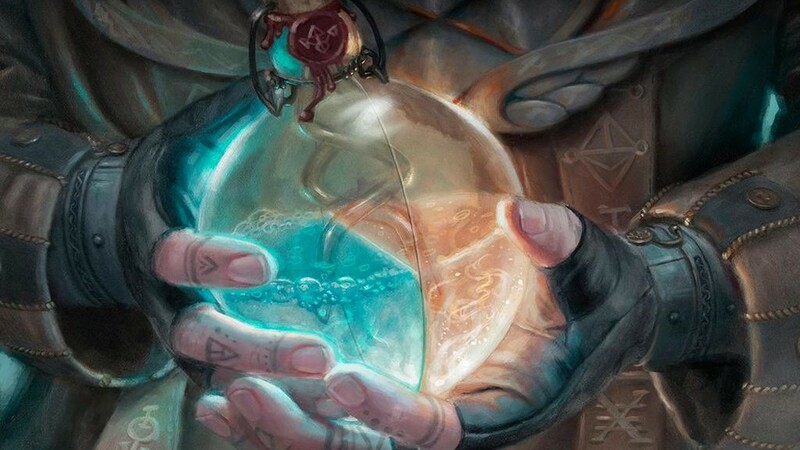 I want to use a recent card (higher supply) that gets Modern and Legacy play (greater demand for exotic foils) and compare what the sites offer. Monastery Swiftspear makes for a useful comparison point. 208 foils! I can, with a couple of clicks, narrow that to non-English ones…still five pages of listings! So here, for comparison’s sake, are the first page and the last page. Look at that selection. Lots and lots of shiny Swiftspears, in just about any language. Sure enough, Spanish and French foils set a low bar. Eight Euros is less than $10, but we will get to the conversion rate and why it’s important in a moment. Let’s jump to the end. Japanese, Russian, and Korean top the list, though there’s a wide range for any of the languages. Still, that’s what we get when we allow people to set their price. 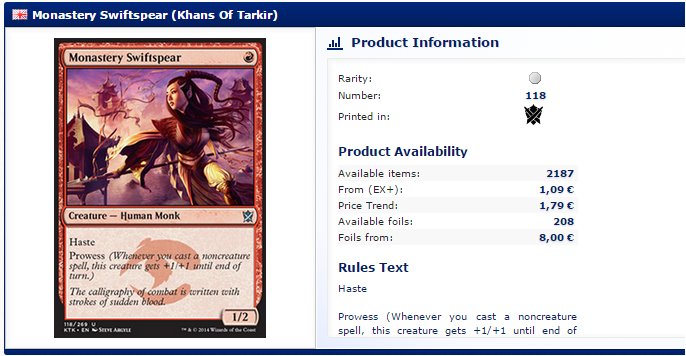 Now, TCG’s low on foils. Now, the cheapest English NM foil is $14, noticeably under the cheapest foreign foil…though that’s a Spanish foil, not really the chase version. Wow. Only three non-English Swiftspears on TCG. That’s a surprisingly low amount of stock. Or is it? There’s a problem with my method, in that I can’t tell if TCG just moves more cards. This is a snapshot, not a documentary. I don’t have access to the sales that have happened. It could be that people have simply bought a lot more of these cards from TCG than MCM. It could be that the prices were better. 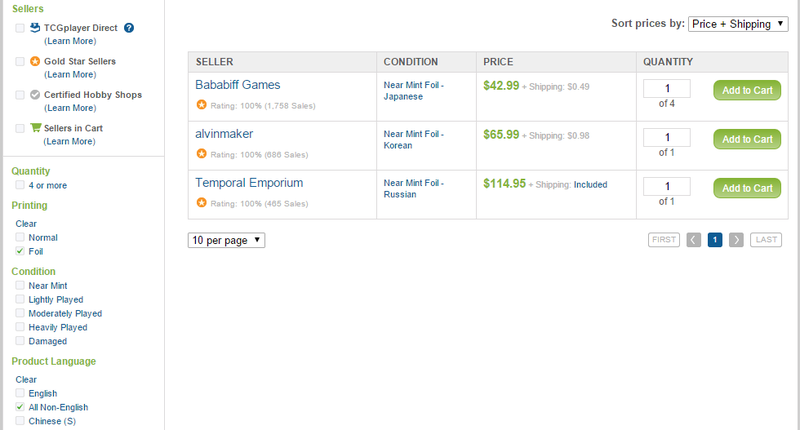 I wish I could make a definitive statement about why MCM has more than a hundred available, and TCG has three. Note that TCG doesn’t currently have anyone selling Spanish, Italian, German, or French foils, but I can’t say why. Just for the comparison, let’s look at eBay. One sold listing for Russian foils, six weeks ago. Korean had one in June, Japanese has six in the last two months. If you can find it on eBay, you’re likely to get a better price than TCG, but hopefully that’s not news to you. First of all, if you are in Europe or have a friend that is, you should be on MCM. If I had someone I trusted on the continent to be my letter drop, I’d do that in a heartbeat. The selection and price are the best you’ll find, most likely because of the additional costs and headaches of being an American or Canadian buyer on the site. Because they have limited their market, there’s more available at a lower price. It bears mentioning that the euro has fallen dramatically against the dollar recently. Just a handful of months ago, it took $1.40 to get one euro. Now it’s down to $1.10, a price that means conversion gets us more. For example: there’s a Korean foil Swiftspear for €60 listed. Forgetting shipping and admin costs, that would have cost us $84 at the beginning of the year. Now it’s $66, just because of the fall in conversion rates. That $18 is a big fall as exchange rates go, so this might be the lowest point for currency exchange, but that’s not my field of expertise at all. Second, the price hierarchy for the assorted languages is still holding even when marketplaces are at work. People are paying more for some languages and less for others, even in the absence of hard data about the print runs. I’d love to dive into that information. Does Portugese really outsell Spanish? Are there that many more German cards than Russian? Finally, TCG is apparently a more popular method of moving non-English foils than I thought. Looking at other cards, there aren’t many with a huge selection of languages, but again, I’m not sure if that’s a lack of supply or cards getting snapped up as soon as they are listed. So if you see what you want on TCG, you should get it. Stuff isn’t staying there for long. Get out there and buy some foreign foils! Would like to hear more about why Russians are the most expensive foils out there. why are russian/jap/korean more sought after exactly? We think. There just isn’t a lot of data and it’s a topic I really want to explore. Ideally, printed amounts in a language would match up with sales, but sales don’t necessarily track with populations who speak a certain language. Korean is sort of a special case, as it wasn’t a language Magic was printed in for a few years, indicating that demand was quite low. is there a good place to get values on Russian and Korean foils? every once in a while people have some rares or foils and I never know how to value for trading. eBay is one, checking completed sales is always a good idea. MCM will often have your card listed, but then you have to do the conversion math. Star City has some foil prices listed but that’s inconsistent–they have to have a foil of your language in stock to list a price. Alternatively, you can figure it out yourself. Take an English foil price and if it’s Russian or Korean, multiply that by 1.5 or 2, or more if it’s highly sought after in Legacy. That would be my rough estimate if I couldn’t find any of your card. You can also reference the local stores. 1.5 is a pretty good ratio but if the card isn’t anything sought after then you don’t have to pay a premium. For Japan I know a lot of people who use Saito’s shop as a reference. Looking through that site will give you an idea. Most cards aren’t worth much more than their English version except for a few chase cards in each set. For those people just make up their own prices. 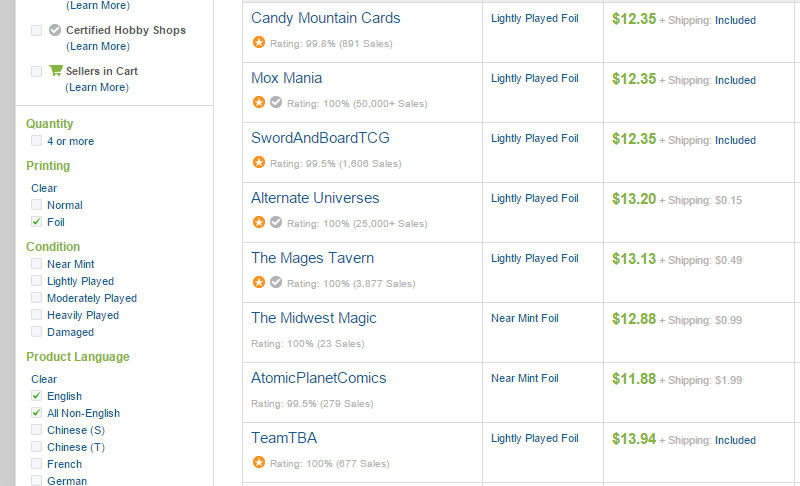 I have heard everything from $25 to $60 for a Korean FNM Path to Exile. If you ever have a long car ride, you can play my favorite Magic road game- “JP Foils”. Someone searches “Japanese foil” on eBay, and then scrolls through all of the cards. The rest of the car has to guess the price (Price is Right style, so closest without going over), and then you can keep score of who gets the most right. The more general your search terms, the more cards you have to “play”. It’s fun, and doesn’t exclude the driver! And sometimes you’ll buy stuff!